The Chipper Clipper: Amazon: One Day Only 7 Christmas Classics on DVD for $12.99 ! 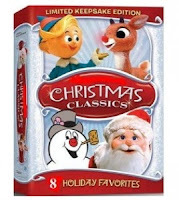 Amazon: One Day Only 7 Christmas Classics on DVD for $12.99 ! Today only, Amazon has a Christmas Classics DVD set for $12.99 with free shipping for Amazon Prime members. That's $1.85 per DVD! You will also get $4 Video on Demand credit with purchase (one per account.) Plus there is a bonus CD included with the set.